Serving God through an outreach of love that responds to the physical, emotional, and spiritual needs of hurting people. Services include: providing shelter to the homeless, long-term recovery programs, Christian counseling, and a pregnancy center. 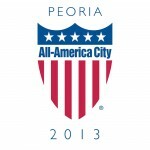 Divisions include: Peoria Rescue Mission, Victory Acres, Barnabas Center, Esther House, and Women's Pregnancy Center. Administrative Office and Rescue Mission located on Adams St, across from the Peoria Police Department and next to Dozer Field.